Love.ly, which was acquired back in 2008 for $5,000 was resold on Sedo for $20,000 earlier this year. 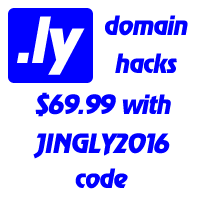 This spring we saw another top .ly sale of 3.ly, also at Sedo, for €10,100 ($14,241). Current.ly, the domain name does not resolve.